The nation’s medical schools made notable gains in diversifying their entering classes in 2018, according to new data released today by the AAMC (Association of American Medical Colleges), which show increases in the number of women and those from some racial and ethnic groups applying to and enrolling in medical school this fall. For the first time since 2004, more women than men applied to U.S. medical schools, comprising 50.9% of applicants. Women were also the majority of matriculants (new enrollees) to medical school for the second year in a row (51.6% versus 50.7% in 2017). 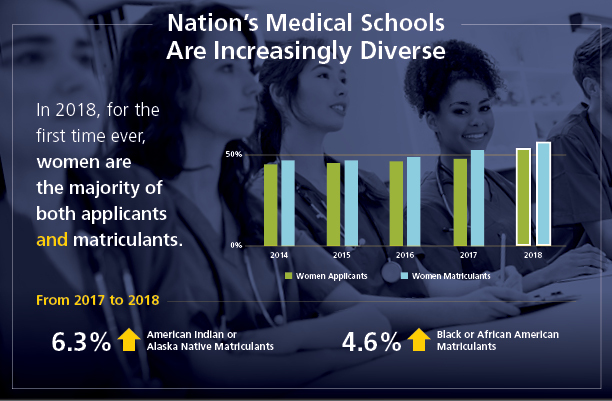 The 2018 data also show that the nation’s medical schools continue to attract and enroll more racially and ethnically diverse classes. The number of black or African American applicants increased by 4.0%, to 5,164 this year, while matriculants rose by 4.6% to 1,856 students. The gains for black or African American men are especially noteworthy, after years of minimal growth or declines: the number of applicants from this group grew 4.4%, to 1,851, and the number of matriculants rose 7.3%, to 734. Note: The race/ethnicity data points include individuals who identified in one or more categories. Source: AAMC FACTS Tables as of Nov. 9, 2018. American Indian or Alaska Native applicants rose by 10.0% to 559 and matriculants increased by 6.3%, to 218 this year. Despite this gain, a new report released by the AAMC and the Association of American Indian Physicians shows that American Indians and Alaska Natives have experienced slow and uneven gains in representation across the medical education continuum over the past 30 years. Overall, the total number of applicants to medical schools rose by 2.1%, to 52,777, after a 2.6% decline last year. The number of matriculants grew by 1.3%, to 21,622. Women applicants increased by 5.0% and women matriculants increased by 3.2% this year. Men applicants and matriculants both declined by less than 1%. As in past years, medical school enrollees in 2018 had strong academic credentials: The average undergraduate GPA was 3.72 and the average MCAT® score was 511. This year’s entering class also demonstrates a strong commitment to service, cumulatively performing more than 12.5 million community service hours. The growth in the number of medical school applicants and matriculants occurs at the same time there is a significant projected shortage of up to 121,300 physicians by 2030. To address this shortage, the nation’s medical schools have expanded class sizes, and 26 new schools have opened in the past decade. The number of medical school applicants has increased by 57% (19,154 applicants), and the number of matriculants has grown by more than 31% (5,134 matriculants) since 2002. Today, more than 2,000 new students are enrolled at one of the 26 medical schools that have opened, representing nearly 10% of all matriculants. Data tables are available here. The race/ethnicity data points include individuals who identified in one or more race/ethnicity categories. For example, black or African American includes individuals who identified only as black or African American as well as those who identified as black or African American and at least one other race/ethnicity category.